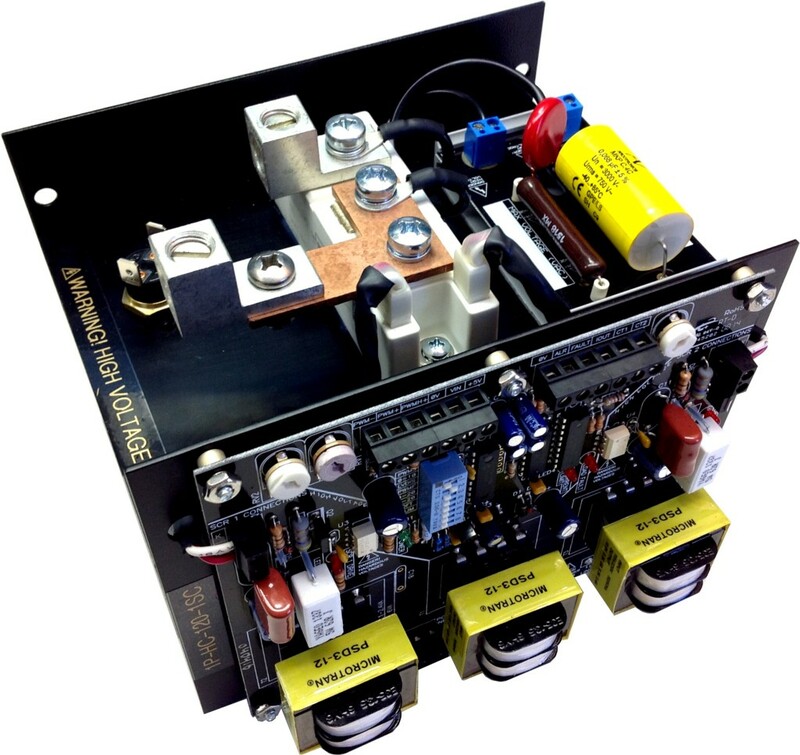 The microprocessor based 1P-HC Phase Angle SCR Power Controller is a compact panel mount package that provides linear power control of the load. The output power is based on the command input and the toroid current transformer feedback. The input can be dip switch selected from most industry standard inputs. Specially designed DC gate driver circuitry and snubber networks allow reliable control of inductive loads. The new SSRTC mounts directly on the input terminals of a Solid State Relay and provides a low cost, conveniently packaged temperature control solution. The input accepts J or K type thermocouples and can be used on heat or cool processes with on/off or proportional control. 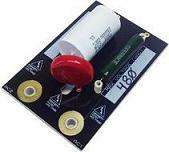 The setpoint can be controlled by a potentiometer or analog voltage or analog current. The temperature setpoint is proportional to the voltage or current at the setpoint input. Status indicators indicate how close the temperature is to the setpoint. Our new small temperature controller – MicroTC is our smallest and lowest cost temperature controller. The MicroTC is factory set for your setpoints and hysteresis. A version is available with setpoint adjustment from an external potentiometer. The small MicroTC is available in 12V and 24V versions and provides a 3 Amp MOSFET output that can be used to drive an SSR ( solid state relay) or small heater. The integral small solid state temperature sensor eliminates the cost of an external thermocouple or RTD. 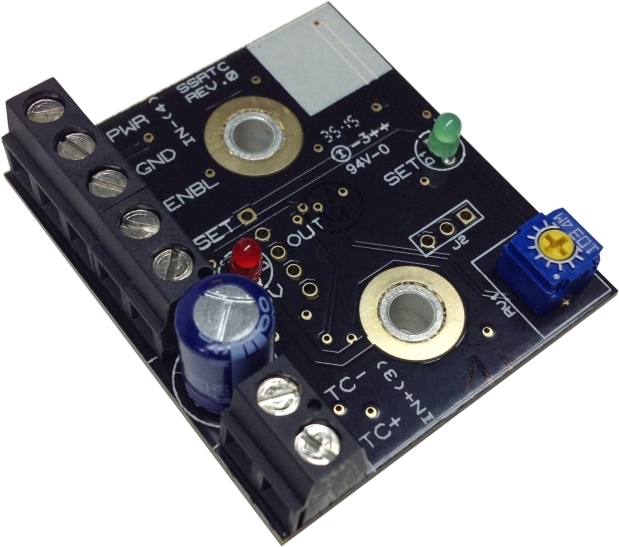 Introducing the new RCSB RC snubber board for Solid State Relays SSRs. The RCSB snubbersuppresses dV/dt and provide reliable commutation. This is especially important when controlling transformer coupled loads as improper commutation can result in huge inrush currents and blown fuses. The RCSB snubber is also used on our SCR power control assemblies. The RCSB is available in 120, 240, 480 and 600VAC versions. 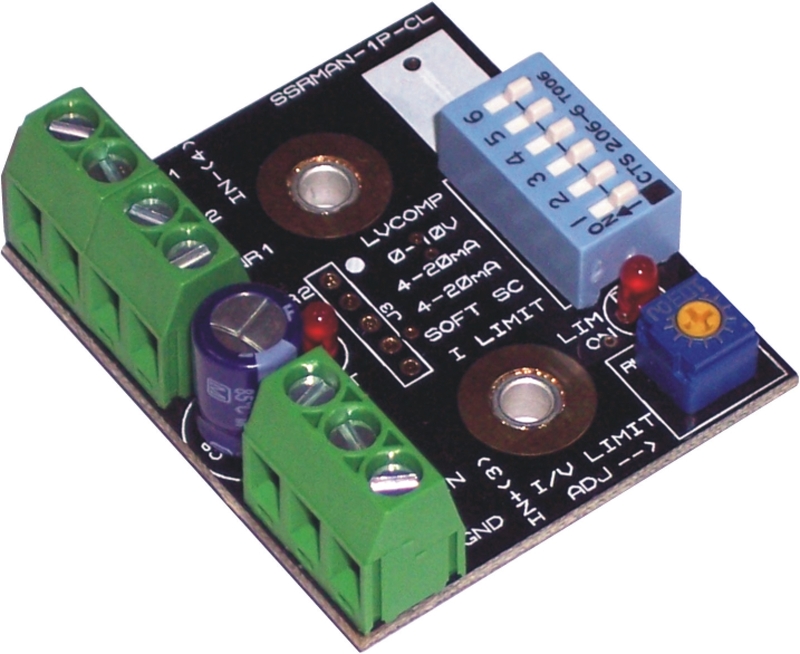 The RCSB Snubber Board mounts directly on the output terminals of a solid state relay. The RCSB provides overvoltage protection from transients and limits dV/dt. 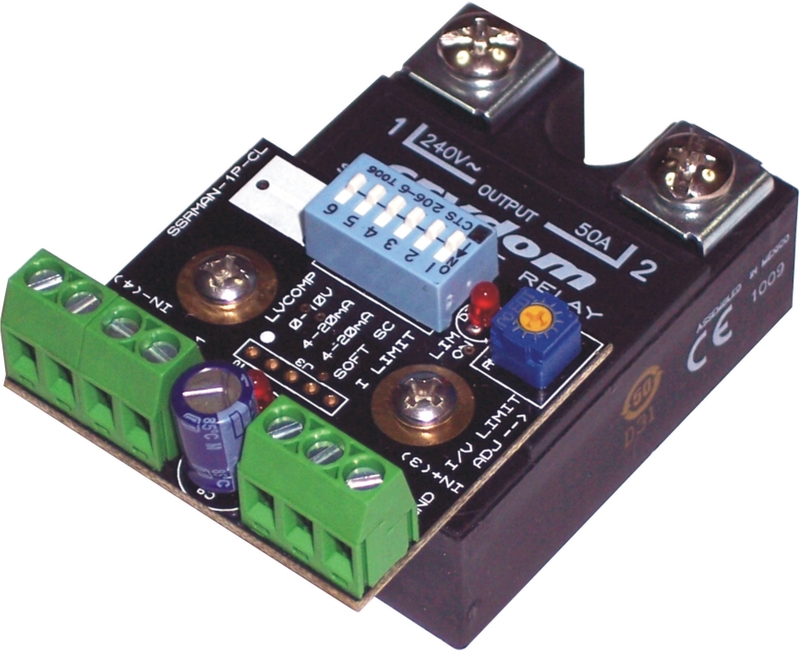 The new SSR Mounted Phase Angle Controller Module SSRMAN-1P-CL mounts directly on the SSR input terminals and provides true linear power phase angle control of the load. The output power is based on the command input and the current feedback from the current transformer. The command can be dip switch selected from over seven different industry standard inputs. Using the SSRMAN-1P-CL with the appropriate SSR for your load will provide a modular high isolation SCR power control at a very low price. An extensive filtering scheme and proprietary zero cross detection algorithm improves noise rejection without sacrificing accuracy. 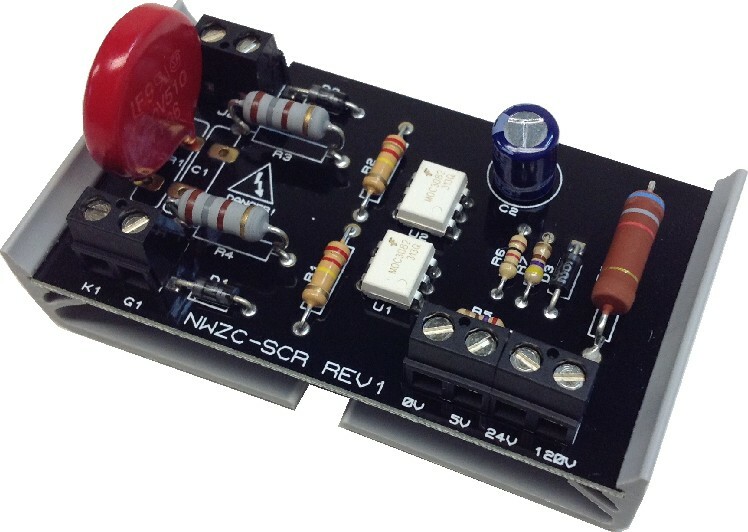 The new ZERO CROSS SCR GATE DRIVER NWZC-SCR, is a low cost SCR driver for driving back to back SCRs in resistive load applications. 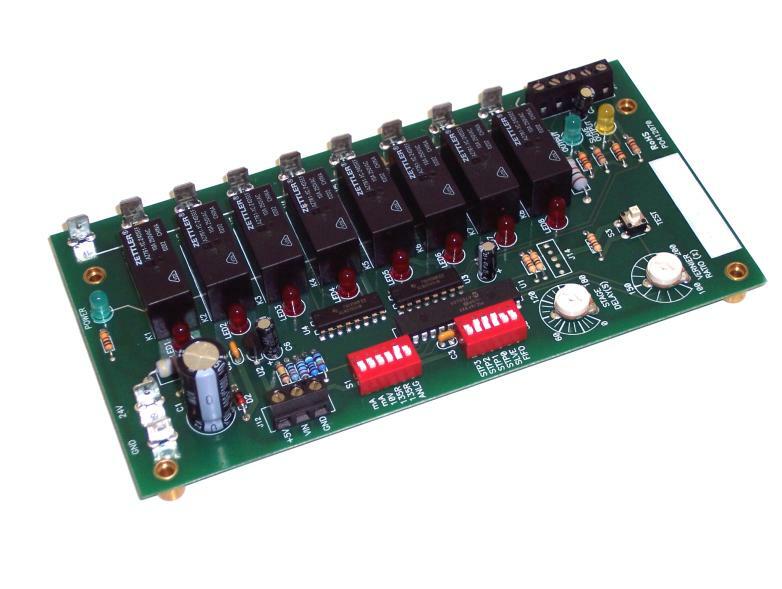 The driver board is zero cross fired and has on board MOV protection. It provides optically isolated 5V, 24V inputs that can easily be interfaced to temperature controllers and PLC Time Proportiong (PWM) outputs. The packaging is available in panel mountable or din rail mountable snap tracks. SCRs requiring 200mA of gate current or less are a good fit for use with the ZERO CROSS SCR GATE DRIVER NWZC-SCR. Wiring of the Module is simple and requires no external power supply; the gate drive power is derived from the line supply of the SCRs. Welcome to the nuwaveproducts.com blog! We are a leading provider of Phase Angle Control SSR Modules, SCR Driver Boards, Din Rail Current Transformers, Custom Electronic Design, and much more. We provide custom solutions for laboratory temperature controls, Barbeque Bbq temperature control, and many different industrial controllers. Please visit us from time to time as we will be adding many technical articles and application notes.